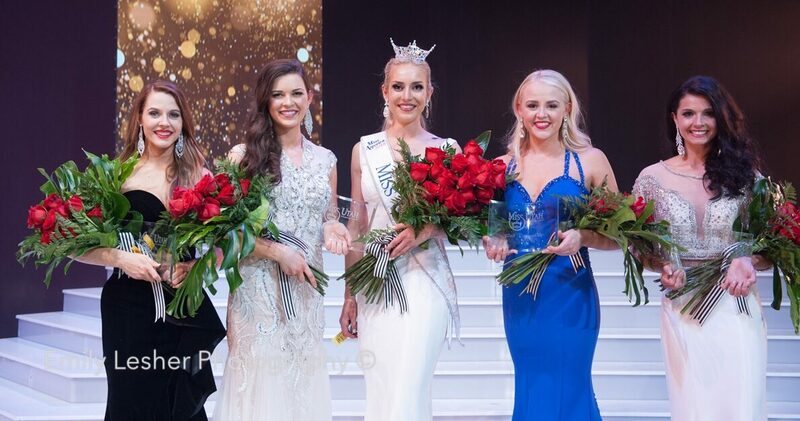 On June 16, 2018, Miss Timpanogos, Jesse Craig was crowned Miss Utah 2018 at the Janet Quinney Lawson Capitol Theatre in Salt Lake City and awarded a $10,000 scholarship. Over the next year, Jesse will travel several thousand miles each month performing, speaking to audiences about her platform, “Get Up and Serve: Increasing Young Adult Involvement” and serving as a state ambassador for the Children’s Miracle Network. Jesse will also compete in The Miss America Pageant on Sunday, Sept. 9, 2018, in Atlantic City, New Jersey. Jesse is a graduate of the University of Utah with a Bachelor of Arts in English with Honors and Bachelor of Science in Economics. For her talent, she played “Misirlou and the Bee,” which she self-arranged. During the third night of preliminary competition, she received the preliminary talent award and a $100 scholarship. She also received the Glenn Harmon Instrumental Music Award and a $500 scholarship. 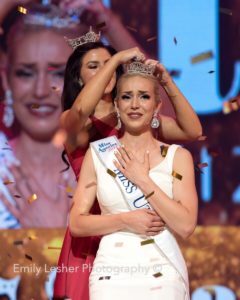 Along with the title of Miss Utah 2018 and a $10,000 scholarship to the school of her choice, Murdock Hyundai gave her the keys to a brand new car for the year. First Runner-up: Miss Springville/Mapleton, Miriam Hall, received a $4,000 scholarship. Second Runner-up: Miss Nebo, Alexa Knutzen, received a $3,000 scholarship, as well as a preliminary swimsuit award and $100 scholarship. Third Runner-up: Miss Orem, Amanda Flinders, received a $2,000 scholarship, as well as the Sadie Huish award and a $1000 scholarship. Fourth Runner-up: Miss Spanish Fork, Dexonna Talbot received a $1,000 scholarship, as well as a preliminary swimsuit award and preliminary talent award both $100 scholarships. The additional seven semi-finalists rounding out the top twelve and each earning a $500 scholarship included: Miss Utah Valley Tanesha Bland, Miss Davis County Sasha Sloan, Miss Pioneer Valley Taylor Jones, Miss Eastern Utah Alexsys Campbell, Miss Carbon County Mikelle Monson, Miss Greater Salt Lake Lizzy Palmatier, and Miss Utah Valley University Natalie Jaco. Please note that this list only represents the awards given during the final night of competition. For details on other special awards given throughout the week, see the preliminary competition results here.